Will the National Coalition of Revolutionary Forces in Eastern Ghouta Be Able to Unite the Revolutionary Forces? Note: This report is the third in a series dedicated to the institutions set up by the opposition in the areas controlled by the opposition in Eastern Ghouta. You can read the first two reports here and here. (Eastern Ghouta, Syria) – The National Coalition of Revolutionary Forces in the Ghouta of East Damascus is trying to create a political and administrative umbrella in Damascus’ Ghouta region, an area liberated months ago but still subject to a siege by Syrian President Bashar al-Assad’s forces. 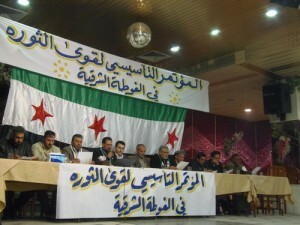 A picture of the founding conference of the coalition. Credit: Facebook. One of the coalition’s objectives is to “work to mobilize all the energies and efforts of civilians and fighters to achieve the goals of the revolution” and to “coordinate with all actors and representatives of the revolution in all parts of Syria, in order to achieve a national body of unified forces of the Syrian Revolution” and to “manage the revolution and safeguard its principles. The Secretariat includes representatives from local councils and armed opposition groups. It has a number of specialized sub-offices for the management of political affairs, services, relief and agriculture. Nizar al-Smadi, an engineer and the general coordinator for the coalition, said that the formation of the coalition came in response to changing realities on the ground, particularly the decline of the existing representative bodies such as the Local Coordination Councils, and the administrative vacuum left after the area was liberated and the regime withdrew its services. Smadi said the need for a new representative body emerged to face these challenges and unite the civilian and military forces of the revolution. The problem, however, is that each new revolutionary body or group has not taken into account existing entities and tried to cooperate with them. This has led to new disputes within the revolutionary forces. The coalition appears to be a compromise solution, neither blessing the existing bodies nor seeking to replace them. “Many of the members of the coalition have contributed to the formation of local councils in their cities and towns,” he continued. “We in the coalition supported these efforts and tried to replicate them in all the cities and towns of the Ghouta. We, and others, strive to create a unified internal system for these councils that take into account the specificity and circumstances of each region. We are working to build connections between each of the local councils and find a truly representative model for a unified local council for the Eastern Ghouta to serve an elected local government and manage the affairs and public services of the region. The coalition intends to build an internal opposition force as an alternative to the exiled opposition which has failed, in its eyes, to represent the revolution as it should. But recently, the formation of another coalition, with nearly identical goals, was announced following a conference in Eastern Ghouta. Smadi said this latest group, the Union of Revolutionary Powers, is attempting to start from scratch rather than build on the experience and efforts of so many who came before. The coalition does not hide its ambitions to play a leading role in the Eastern Ghouta. He goes on to list all the service projects currently being carried out by the coalition, including a potable water project and the repair of breakdowns in the electricity network, and creating a central office for waste collection. The coalition has also helped support relief campaigns for the poorest and most affected areas in the Ghouta as well as setting up field hospitals. In any case, it seems likely that more than one initiative will come to fruition in the liberated areas soon. The hope is that the opposition inside Syria does not make the same mistakes as the opposition abroad by succumbing to fracturing and infighting, and that it is able to work under such exceptionally difficult circumstances.